Three camels sway out of the darkness along the main street of Nuweiba. 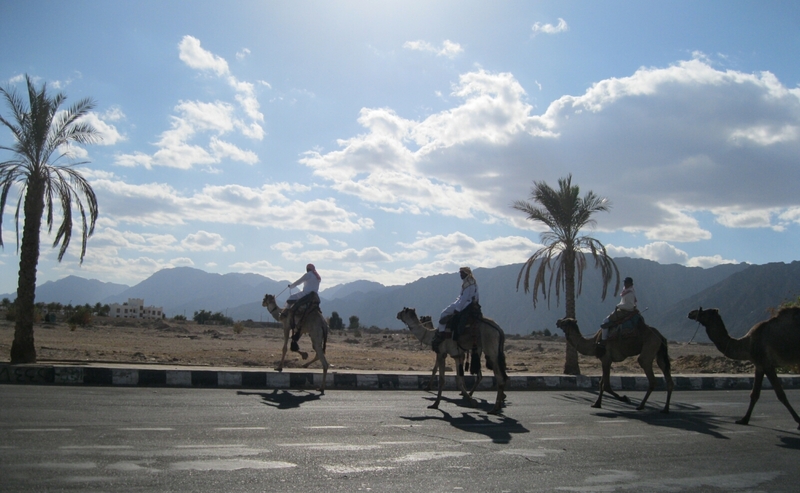 They have no tourists or even their Bedouin owners riding them, and no-one seems to be accompanying them. They seem larger in the dark than in the daylight, when their cream and brown coats blend into their sandy environment. They can see me, their soft eyes they are watching me carefully as they move slowly down the street. As they move close to me, I want to go up to them and stroke their necks and talk to them, but their movement is so peaceful that I do not disturb their progress, I just stand and watch. They disappear up the road, past the main café with its patrons clustered around two televisions, watching the first session of the new Egyptian parliament, and they sail on into the darkness. These are the moments that make Nuweiba more than just another tourist town on the Red Sea. Settled on the eastern peninsula of Sinai, between the Sinai mountains and the Gulf of Aqaba, Nuweiba looks over to Saudi Arabia, Jordan and Israel. You won’t see unaccompanied camels in the street every day, but you will always have the magnificent mountains on one side of you, and the sea on the other, and many other wonderful sights close by. Nuweiba is the home base of Nature Travel, and we can show you the best of this region and beyond. You might even get lucky and see those camels sailing down the street. This entry was posted in NUWEIBA, SPECIAL EXPERIENCES. Bookmark the permalink.